Runners in the first wave break from the start on rain soaked streets during the 122nd running of the Boston Marathon in Hopkinton, Mass., Monday, April 16, 2018. 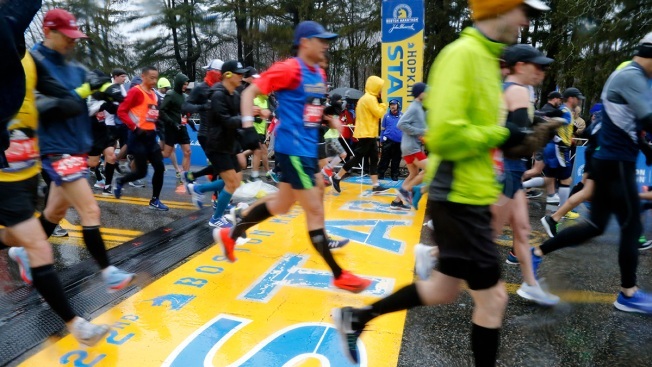 The Boston Marathon has agreed to pay the equivalent prizes to five women whose net times would have placed them in the money if they had run in the elite field. Five women who ran in Wave 1 — which left Hopkinton about 35 minutes after the elite women — had net times from start to finish that were among the Top 15 (or Top 5 in the masters division). Race rules specify that only those women who had qualified for and run with the elite field were eligible for prize money. Among them was fifth-place finisher Jessica Chichester, who will receive $15,000. The total amount of additional prize money was $21,700. The separate start for the elite women was created in 2004 to focus attention on the race. Previously, the leading women had to weave among straggling men as they headed down Boylston Street to the finish line.